Use once a day for all-day hold! 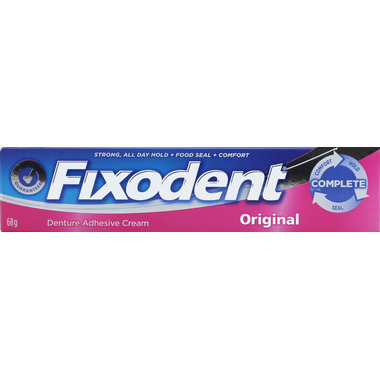 Fixodent Original Complete lets you experience life, not dentures. This is a wonderful denture adhesive...holds dentures in place all day...no concern that they will move. I have used this product a long time. I have tried many others but this one is the best. It secures my dentures. I have arthritis in my hands and the tubeing on this product makes it easy for me to use. Impossible to empty contents due to plastic tubing . The clainm that a single application lasts an entire day is an exageration which is tempered by the fact that my dentures were poorly made . In any event , it works best of any brand I've tried . Good Product and Great Service! !